I remember the first time I heard the term SCORM. I was a software developer working on a quizzing product that needed to export data to a variety of e-learning systems. It was suggested we should support SCORM. So I researched but quickly got lost in the minutia of details and acronyms -- AICC, CMI, SCO, XML, ECMAScript, manifest, packaging, and API. On top of that, I found out about the ADL initiative and the Department of Defense involvement in the specification. Woah! Wait a minute. What are we talking about here? I just want to get my content to my customer in a form that they can use it! It turns out I had to know most of that stuff for my job. But most people producing e-learning content can rest assured that they don't need to know these details. You just need to know that e-learning content sometimes needs to be exported to SCORM so that it can be used in an LMS. Here's everything you need to know about the anatomy of a SCORM module. The version of SCORM doesn't matter for this simple explanation. And here's the best news...with today's e-learning development tools, you only need to be concerned about one of these pieces! If you are an instructional designer or developer of e-learning content, chances are, you'll only need to worry about the Learning Content piece. This is what the learner sees. It is based on an instructional design or storyboard. This piece contains all the images, audio, video, and text that learners will need to consume. Many times the learning content contains a quiz as well. Ideally, this is where you will spend all of your time developing the course. 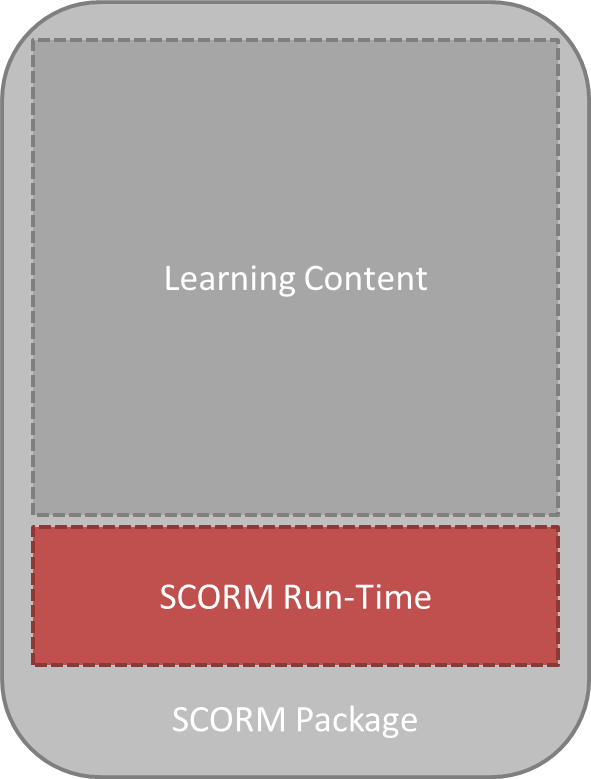 The next piece is the SCORM Run-Time code. E-Learning development tools like Adobe Captivate, Lectora, or Articulate do all of this for you. So don't sweat it. But for those curious, this is the "language" the e-learning module uses to communicate with the LMS. The run-time code is used to send messages to the LMS like "the course was started", "the learner scored 80% on the quiz", and "the learner has mastered this material". And vice-versa, the LMS can use the run-time language to tell the e-learning module information like the learner's name or a bookmark that tells the e-learning module where the learner stopped previously. The last piece of the simple anatomy is the SCORM Package. As before, if you use an e-learning development tool, this is often taken care of for you. There are a couple of things worth mentioning about the package. The package is simply a compressed (aka zipped) folder of files. There is a magical file included called the imsmanifest.xml file that instructs the LMS on how to use the files in the package. There are rare times where you may need to tinker with this package. For example, to add a referenced file like a PDF or video. How does your understanding of the SCORM anatomy differ from this? What about SCORM has been a challenge for you?